It is a well-worn cliché of the Trump presidency—which is also to say, it is a well-worn cliché about the Trump psyche—that, within a White House as vertically integrated as this one, loyalty counts above all. And Sarah Sanders, the press secretary who will have been on the job, this week, for one year—the White House announced her promotion to the role in July of 2017—performs that loyalty every time she meets the press. Sometimes standing by the president—supporting Team Trump from within—comes down to subtler work: taking Trump’s actions and coating them with the palatable veneer of evident normalcy. Michael McFaul, Bill Browder, Vladimir Putin, the notion that the United States might decide to use its citizens as bargaining chips in order to make deals with a despotic regime known for murdering dissidents: We’ll let you know if there’s an announcement on that front. But it is also an approach that is wholly consistent with the Trumpian worldview—one that valorizes strength above all (he has “great control over his country,” the president has mused of Putin), one that is populated by a collective of uses and thems, one whose sum, always, is zero. A world of winners and a world, consequently, of losers: It is perhaps the clearest distillation of Trumpism. This White House, whether it is taking on health care or gun policy or tax policy or immigration policy, assumes everything is a competition—and reveres, to the general exclusion of the alternative, #winning. Sickness is weakness. Poverty is weakness. Otherness is weakness. And Trump understands the world according to one crucial insight: He himself is not weak. He is strong. Sanders has transformed the job of the press secretary itself in the year that she has spent as its occupant. Gone are the tense cordialities that defined the tenures of the Obama administration press secretaries Robert Gibbs and Jay Carney and Josh Earnest; gone, too, are the shouted lies of Sean Spicer and the swaggering camp of Anthony Scaramucci. Instead, briefing by briefing, Sanders strides to the lectern in the Brady briefing room and makes an argument about who belongs among the world’s winners . . . . and who must be counted among its losers (congressional Democrats, Democrats in general, Barack Obama, Hillary Clinton, Nancy Pelosi, the American news media who are not on the payroll of the Fox News Channel). In the summer of 1954, a group of 22 boys, all of them rising sixth graders, were invited to spend time at a summer camp in the Sans Bois Mountains, in southeastern Oklahoma. . . . would come to be known as the Robbers Cave experiment. Robbers Cave, Lord of the Flies but with better experimental design, remains a dire warning, not only when it comes to psychology, but also when it comes to democracy—a lurking suggestion of how readily humans can be convinced to turn against one another on the grounds of otherness itself. It has lingered throughout American history. James Madison worried about factions and Alexander Hamilton worried about demagogues and the Framers as a messy collective worried about the inevitable inertias of human pettiness . . . . It is a fear that is realized every time the person whose job it is to help the American people understand the daily doings of the executive branch instead mocks White House reporters to their face. 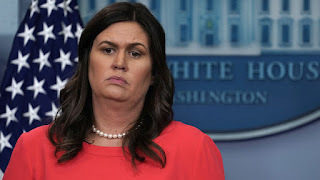 It is a fear that is realized every time Sanders, the daughter of a man who has made a career with the help of regular denigrations of the “media” (a collective to which, through a TV show broadcast to the masses, he insists he does not belong), uses her pulpit to promote the president’s “fake news awards.” It is a fear that is realized every time Sanders accuses reporters of “purposely putting out information you know is false” and “purposefully misleading the American people”—offenses that, anyone familiar with the workings of the press will know, are grounds for instant firing. This is a time of factions, of widespread bad faith, of normalized trolling, of the plodding weaponization of everything. But Sanders, for her part, serves as an omen in real time: a reminder of what happens when the airy ideals of republican government—compromise, commonality, objective truth—get refracted through competition and resentment and battle It is this team—her team—that Sarah Sanders stood up to defend on Wednesday, as she has done so many days before: a team that, in her apparent estimation, included the president of Russia but did not necessarily include her fellow Americans. Hours later, Sanders had more news to break: The president is planning to invite Vladimir Putin to America, to visit the White House, this fall. Neatly wrapped in the language of bureaucratic protocol (“ongoing working-level dialogue”), you can almost overlook the fact that Sanders is announcing that a dictator will soon be welcomed to the West Wing. This is the new world order to which Sanders is so fiercely loyal. This is Donaldpolitik. Her president, right or wrong.